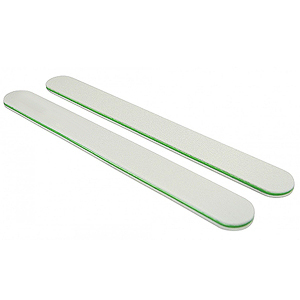 Disinfectable nail files are specially designed for professionals or home use. Files made of material that does not absorb moisture and can be disinfected in sanitizing solution. 1. Put nail file under running water and brush the grit surfaces lightly using a disinfectable plastic manicure brush to brush off all debris, soil, dust, etc., from the file. 2. Spray with an EPA-registered hospital-level disinfectant then brush lightly again. B. Soak in hospital-level disinfectant for 10 minutes, remove, and let air dry. Be sure to check with your local, state and federal regulations regarding proper sanitation laws if using this product in a salon.